Last Call: What Other Embarrassing Food Industry Job Did Paul Ryan Have? 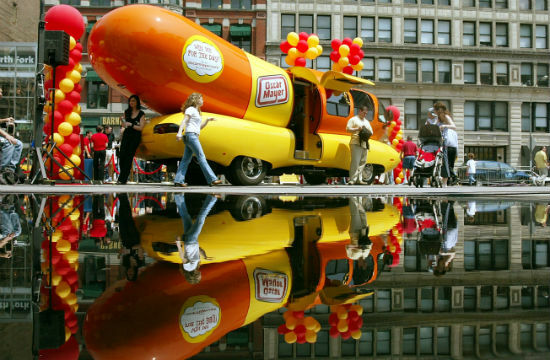 Jalopnik: Paul Ryan used to drive the Wienermobile. So to recap: Tortilla Coast; Wienermobile; potentially one heartbeat away from running the nation. GrubStreet: Beloved P.J. Clarke’s bartender Doug Quinn, who was allegedly fired for trying to get a drunk male patron who had groped a woman at the bar kicked out, is opening “a real New York Saloon” of his own by “end of fall…or definitely by January 1st.” We’ll be first in line for harassment-free cocktails. Gawker: Mountain Dew sponsored an online contest called “Dub the Dew,” encouraging people to submit entries to name its newest green apple-infused soft drink. Luckily, 4chan hacked the site and shot names like “Fapple,” “Gushing Granny,” and “Hitler did nothing wrong” to the top of the list. Thanks, guys. Washington Post: Joining the ranks of Ryan Lochte and other Olympic swimmers downing cocktails with hefty pricetags on the house, Jamaican sprinter Usain Bolt, AKA The Actual Fastest Man In The World, was gifted a $125,000 “Nebuchadnezzar” of Ace of Spades champagne at an after-party. That would be the equivalent of 20 bottles. Ahem. Eater: Kitchen Nightmares, AKA, Gordon Ramsay’s version of Restaurant: Impossible is now casting in Nashville, Seattle, and Phoenix. …Does Seattle have bad restaurants?